Seattle is a large city, so there are options galore when it comes to food. You can find anything: Japanese, Greek, Thai and hell, probably even Japanese-Greek-Thai fusion (we’ll let you know if we really find that). Tove and I were itching for Indian food the other day, but we weren’t really sure where to go. Naturally, we checked out Yelp and Urbanspoon and both pointed us to the same place: Taste of India in the University District. Yelp and Urbanspoon both boast Taste of India (5517 Roosevelt Way N.E.) as the best Indian food in Seattle, so we quickly made a reservation. The restaurant’s location was perfect for us that night as well, because we were going to see a concert at the Neptune Theatre (about a 15 minute walk away). Taste of India doesn’t look like much when you arrive. The sign is worn down and the building looks like a typical restaurant. If you’re looking for a place that’s aesthetically pleasing, Taste of India might not be for you (it’s definitely not run down or anything). If you’re there for the food, that’s a different story. Much to our surprise there was outdoor seating at Taste of India, so we asked for a spot outside. The restaurant wasn’t very busy when we were there, so it seemed like there was an excessive number of servers. I would take a sip of my water and a server would literally be there the second I put down my glass to top it off. I think they filled my glass 20 times while we were there. That’s not a complaint — it’s simply an observation. Taste of India kicked off our meal with a complimentary appetizer. We asked what it was called, but it was hard to understand our soft-spoken server. We didn’t want to look like idiots asking over and over again what it’s called, so we just ate it. I’m pretty sure the appetizer was a fried sweet potato (possibly samosa? ), but I’m honestly not sure (I’m clearly a foody). 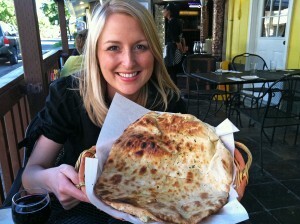 You can’t go to an Indian restaurant without ordering naan (basically a traditional oven-baked flatbread). Taste of India offers a dozen different types of naan. There’s keema naan (stuffed with ground beef, ginger, onions and a touch of cumin), kasmiri naan (stuffed with cherries, raisins, cashews, fennel and almonds), chicken naan (stuffed with chicken, almonds and herbs) and more. Tove and I went with paneer naan, which is filled with traditional homemade Indian cheese. As for our meal at Taste of India, I ordered the tandoori surprise, while Tove went for the mango curry. If you aren’t familiar with Indian food, tandoori chicken is as traditional as it gets. 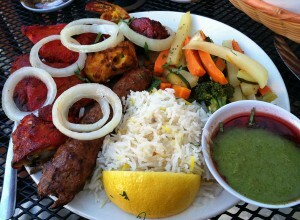 The tandoori surprise was a mix of chicken, beef, lamb, fish and shrimp all cooked in the ancient tandoori style. As for the mango curry, it’s exactly what it sounds like. 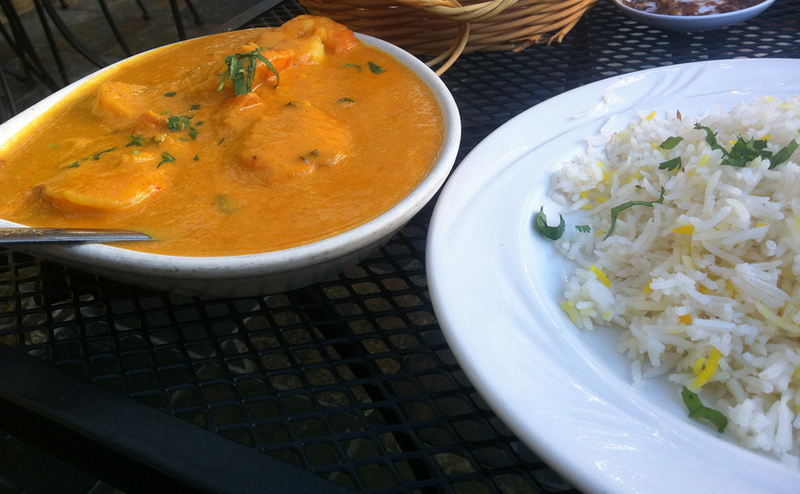 Tove, who was fairly new to the Indian food scene, ordered her mango curry with shrimp, and really enjoyed it. Both of our meals were delicious, and they were also really big. Tove and I both left food on our plates at Taste of India, and since we were going to the concert, we had to leave it behind. Later that night, when we were rummaging around looking for a snack, we both flashed back to our meals and really wished we had the leftovers. I think it says good things about a restaurant that you crave their cold, hours-old leftovers. I don’t want to forget to mention that Taste of India also capped our meal with a small piece of cheesecake. We thought the complimentary appetizer and desert were a very nice touch (you can’t beat free, right?). It’s tough to say Taste of India is the best Indian food in Seattle, but I can’t say that it’s not either. To put it simply, I’m not an Indian food connoisseur (although I love Indian food every time I have it). It’s kind of like wine. I can drink a $200 bottle of wine and a $12 bottle of wine, and they both taste the same to me. All I can tell you is that Tove and I really enjoyed our meal at Taste of India. 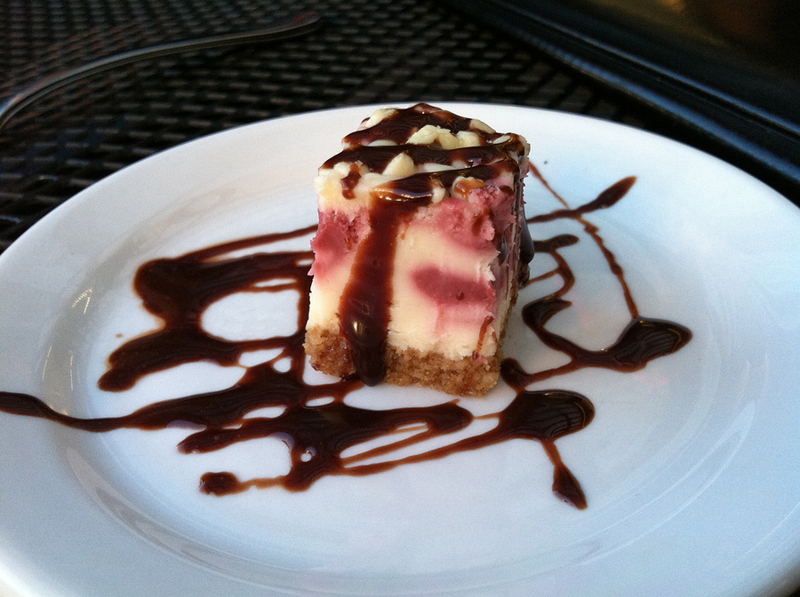 We recommend it to anyone looking for good food in the University District. Have you ever eaten at Taste of India? Do you think it’s the best Indian food in Seattle? If it’s not, what is your favorite place for Indian food? We’d love to hear from you! Please leave a comment below or connect with us on Facebook, Twitter and Google+. Don’t forget to also check out Seattle Bloggers for more great places to eat and drink in the Emerald City and around the Puget Sound!